Staff photo by Jeremy Behnke Sleepy Eye’s Joey Walter delivers one of his three hits in Saturday’s Class C state amateur baseball game in New Prague. Walter had two RBIs in the game and Sleepy Eye advanced with a 3-0 win over Fergus Falls. 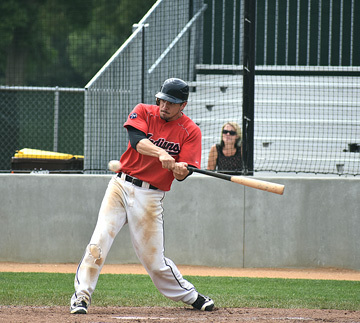 NEW PRAGUE — Sean Mathiowetz went the distance, picking up his second win in a week as the Stark draftee helped Sleepy Eye advance to the third round of the Class C State Amateur baseball tournament with a 3-0 win over Fergus Falls on Saturday. Joey Wall was 3 for 4 with two RBIs and Andrew Woitas was 3 for 4 with a run scored. Alan Woitas had Sleepy Eye’s other RBI. Sleepy Eye will play at 7:30 p.m. on Saturday in Shakopee.